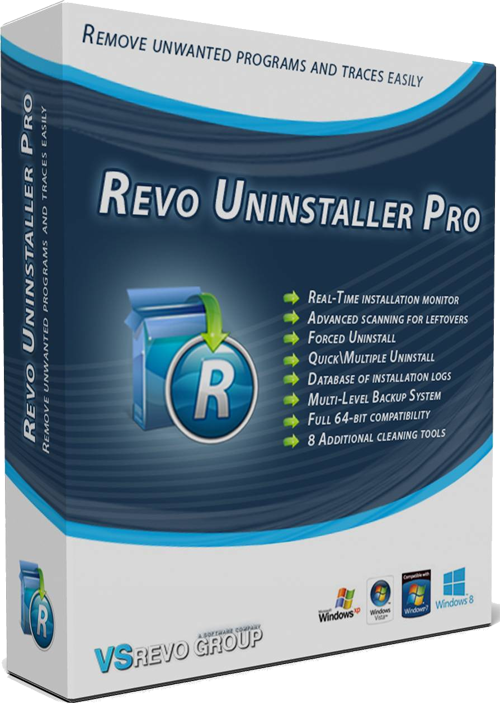 Why Use Revo Uninstaller Pro ? Support : 32 and 64 Bit of Windows XP, Vista, 7, 8, 10 and Windows Server. What Does Revo Uninstaller Do ? Uninstall, stop or delete programs with 1 click only by simply dragging it over desktop icons, quick launch toolbar, system tray or to the open program's window. "It Helps Me Uninstall Undetected Program"
"My computer was infected with an unwanted program "websearch.com" which I could not uninstall using the windows uninstaller - it was not detected as an installed program. I found Revo Uninstaller after a web search and after some mails to their support team, the problem was solved. I can therefore unreservedly recommend Revouninstaller for the removal of unwanted programs. The support team provided first class assistance." Find and remove various types of junk and unnecessary files from your computer. Junk files are created by many of the Windows applications. Cleaning junk temporary files will free a lot of hard disk space. It allows you to manage programs which load automatically at Windows startup. Stopping programs from automatically starting will increase the speed of loading your Windows. Revo Uninstaller erases web site history of web browsers and delete temporary internet files which include all the images, video and web pages you've visited. It will free up a lot of valuable hard disk space on your computer. Remove junk files from your Windows. Microsoft Windows keeps tracks of many things that you do with your PC like file search history; recently opened document history; start menu clicks history, ETC. If you want securely delete file or folder and want to be sure that no body with any tool could recover these files or folders use Unrecoverable Delete. "Better Than Control Panel Uninstaller"
"This program uninstalled the crap I was trying to delete without any problems. Control panel and CCleaner didn't help." "All The Error and Malware Remnant Are Gone"
"After removing several viruses from a friends computer I kept getting the same 'file not found' error, which happened to be a remnant of one of the malware titles I thought I had cleaned up. I ran Revo-uninstall and there was a box of icons displayed including the one from the program I thought I deleted. I selected the icon, clicked on uninstall, set the 'strength' I wanted the utility to run at and the error and all remnants of the problem were gone. It was so nice to be able to restart the computer and not have that error pop up anymore..."
"Get Rid Adware & Bloatware"
"I accidentally installed some adware and other bloatware I didn't want (thanks cnet), and one of them I couldn't uninstall through my normal uninstaller and just couldn't be rid of it, and Revo Uninistaller got rid of it."